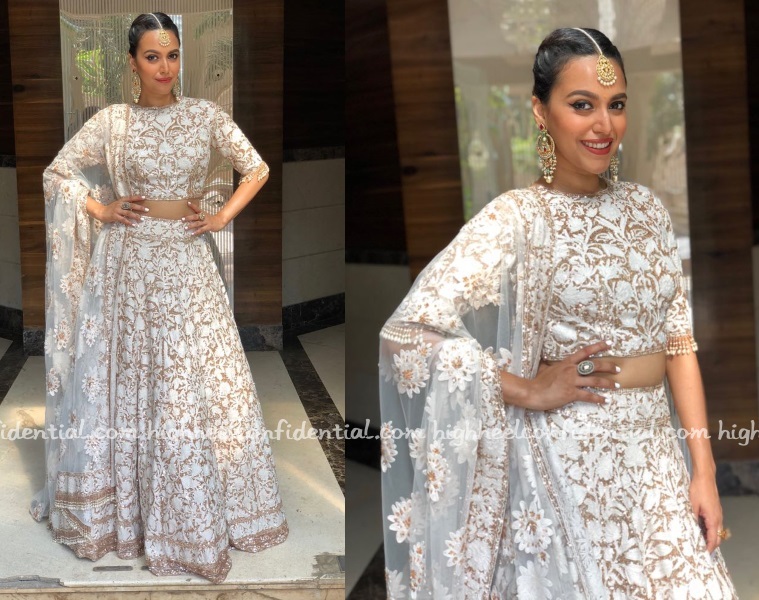 Sonam and Anand’s sangeet ceremony saw Swara in an ivory Manish Malhtora lehenga paired with jewellery from Mahesh Notandass. Not a fan of the floral applique dupatta, would’ve preferred a simpler one to offset the top and skirt but having said that, Swara looked nice! Is this her Sangeet look or her Mehendi appearance for yesterday? The tight hair-do is a downer ..plus too busy design all over. Overwhelming, but she looks pretty. Too busy and not liking the sheer of the outfit at all ! Blouse fitting is so bad!! She looks lovely. Gorgeous outfit. I think a heavy neckpiece and different hair would’ve looked good.